Alexis Goldstein is an artist by nature. 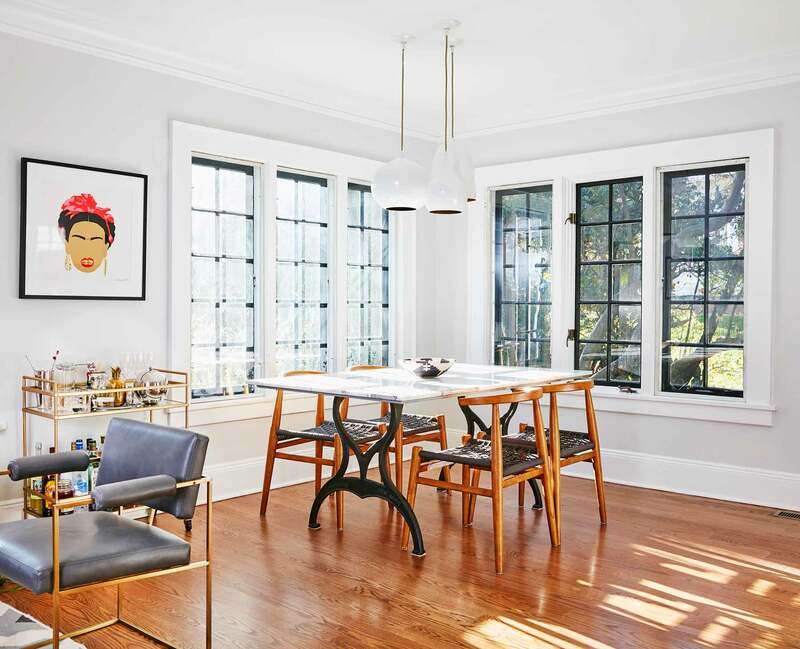 A successful Director of Sales at a major digital property by day, her art hangs from the walls of her Maplewood NJ home and displays itself through the flow, fabric and distinction of her interior design. 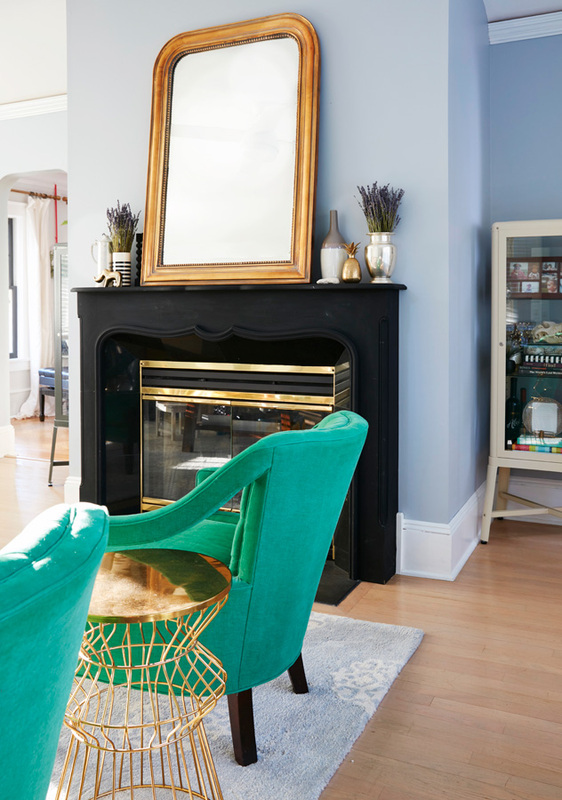 When she and her husband, Justin Goldstein, a Brooklyn-based Realtor at Halstead, set out to purchase a home, their priorities were solid bones, walk to town, classic charm and ample space, none of which they sacrificed. However the home they procured was outdated and poorly designed, obscuring its original beauty. Once they moved in Alexis set out to make changes. 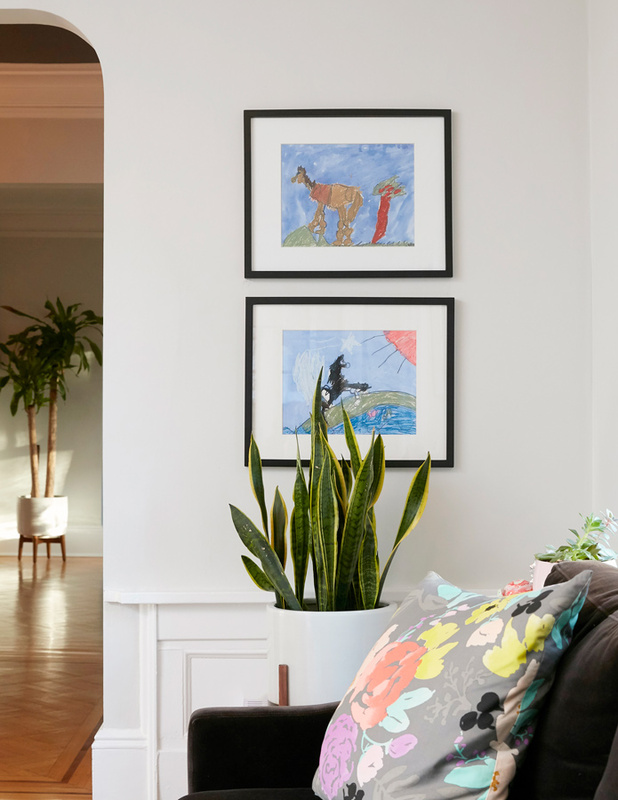 Inspired by the home’s potential, (or “required” by the home’s potential, depending on the way you look at it), her creativity was called to task and Alexis became the mastermind of her own vision–the re-creation of her home. Dictated by her skills and sensibilities, it was natural for her to both design and manage the project…but how does a working mom of two kids do such a thing? She started by collecting her favorite things in an old-school binder and editing them organically. “I have a binder that I keep and every time I see something I love, I rip it out and punch three holes in it. I go back and take out things that I’m not interested anymore, but I’m always adding to it”. 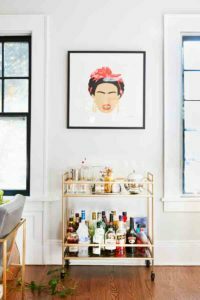 Her go-to is House & Home, a Canadian-based magazine that showcases home decor from all over North America. When the time came to redesign their kitchen and first floor, Alexis was ready. Acting more like an Ad Agency Exec. than a Digital Sales Exec. She created a mood board. “I took this big poster board and taped on cut-outs of each component that I wanted”. She could see it come together before her eyes–the wood, the cabinet color, the lighting, and a stunning marble waterfall feature for which Alexis selected an exquisitely veined marble slab. The waterfall finishes off the durable and family-friendly quartz of the countertops, and amplifies the glam factor of the room. It became a focal point in the sightline of other rooms via the open floor plan. 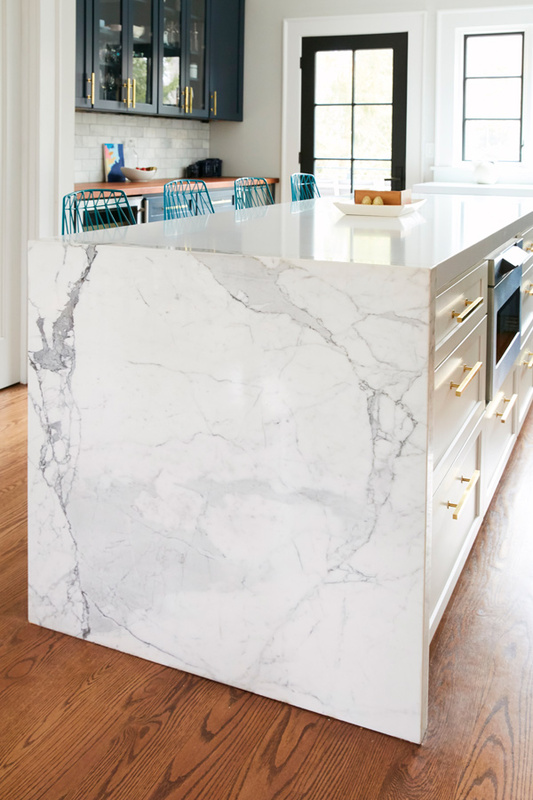 Kitchen cabinets in rich navy contrasted with a beautifully veined slab of marble. SNEAK PEEK! 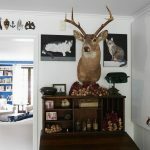 The Goldstein home is Alexis’ ever-evolving art project. Check out the wallpaper sample on the left. 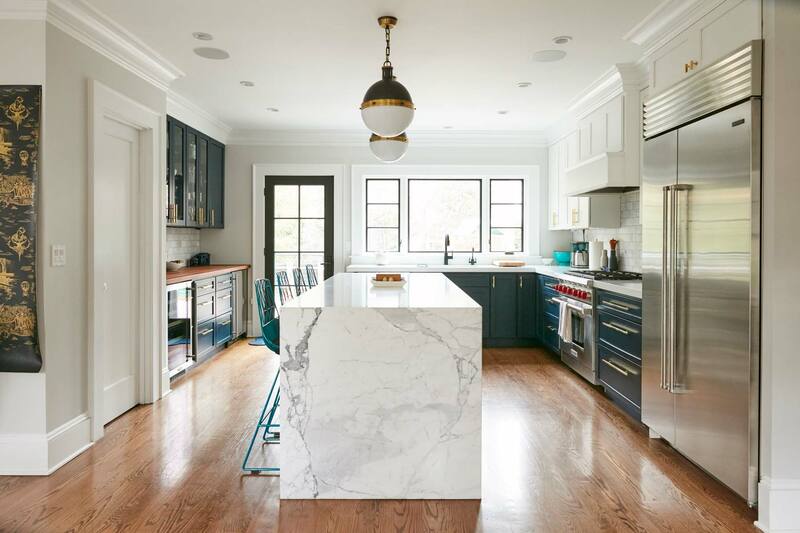 It was designed by Mike D. Yes, that Mike D.
A marble waterfall island is a modern choice for this home built in 1926 and yet when juxtaposed with the home’s classic details it adds a stunning visual point of interest. The lounge includes pieces by this family of artists. To the far left, two art pieces by her daughter. In the middle, a piece by Alexis herself. …and a rockin’ painting of Frida Kahlo. She instinctively knows the rules well enough to break them. “I don’t know, I just had the confidence that it would all work”. 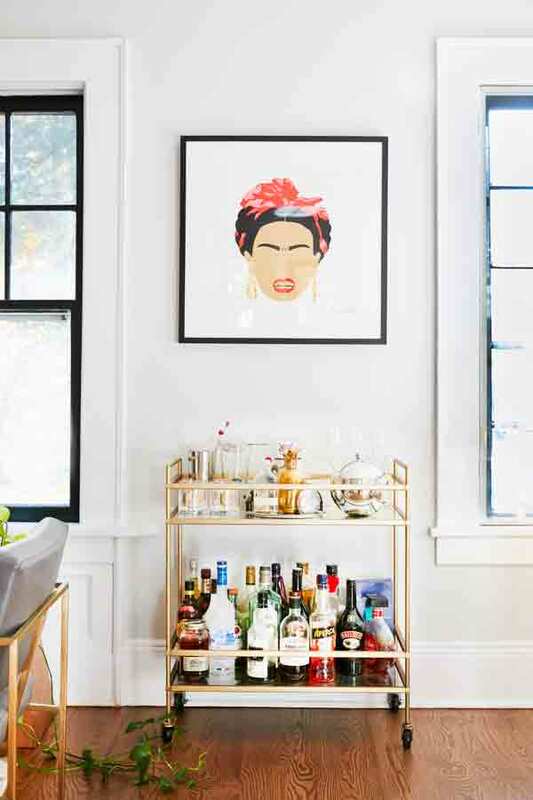 We love a stylish bar cart vignette, where precious objects and functional items work in tandem. Original art by the Goldstein kids. A child’s original art is priceless and displaying it in frames is a wonderful way to make them that this space is in part, theirs. Alexis uses lighting the way most of us use cocktail rings–to make a bold statement and to complete the look. “That’s my jewelry”. She pulls it off with a little ingenuity and stays on the modest side of spending. Three different shaped pendant lights hang in a cluster above her kitchen table from varying cord lengths. “So I bought those three without even seeing them. They shipped from all different parts of the country after I called many Crate and Barrel Stores. It was so annoying but worth it”. (It cost her $40!). A gorgeous handmade table made from vintage machine legs, plywood and a slab of marble, lit by a cluster of white pendant lights. This room also has exceptional natural light. Alexis’ husband, Justin, designed the kitchen table. 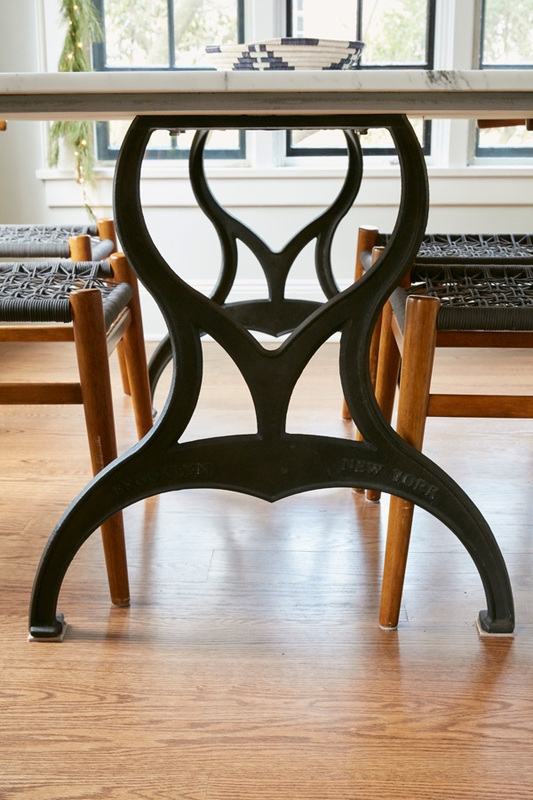 He found vintage machine legs made in Brooklyn at Olde Good Things in NYC. He attached a piece of plywood to the machine legs, used a special adhesive for marble and placed the slab on top. Vintage machine legs from Olde Good Things in NYC. Alexis’s kitchen transformation was jaw-dropping. Domino, the popular online lifestyle and interior design magazine published the before and after photos she submitted. You need to see this! The title of the post says it all: before & after: you won’t recognize this kitchen! When their home was built in 1926, the original living room was what is now their dining room. The space is grand and can easily accommodate several statement pieces that don’t compete, but rather complement each other. The chandelier has arms that stretch across the ceiling to illuminate a custom made table crafted from reclaimed wood by, who else? Justin! He took the boards off the walls in their garage to create a table that can easily fit 18 people. A handcrafted dining room table made from reclaimed wood found in their garage. 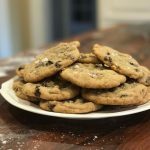 Perfect for entertaining! 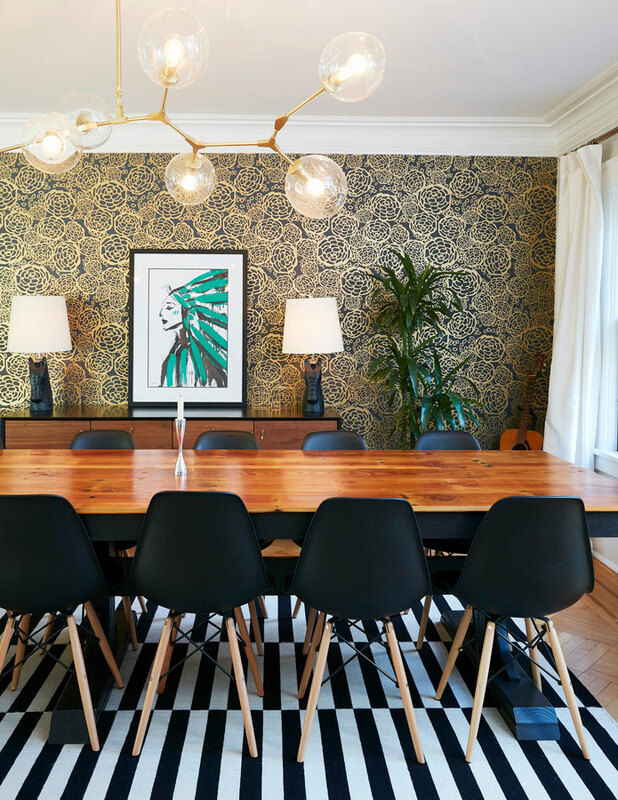 Stunning gold and greyish-black wallpaper looks different in changing light and compliments a custom-made painting featuring an American Indian Chief by a New York City artist, in Alexis’ favorite pop color, green. 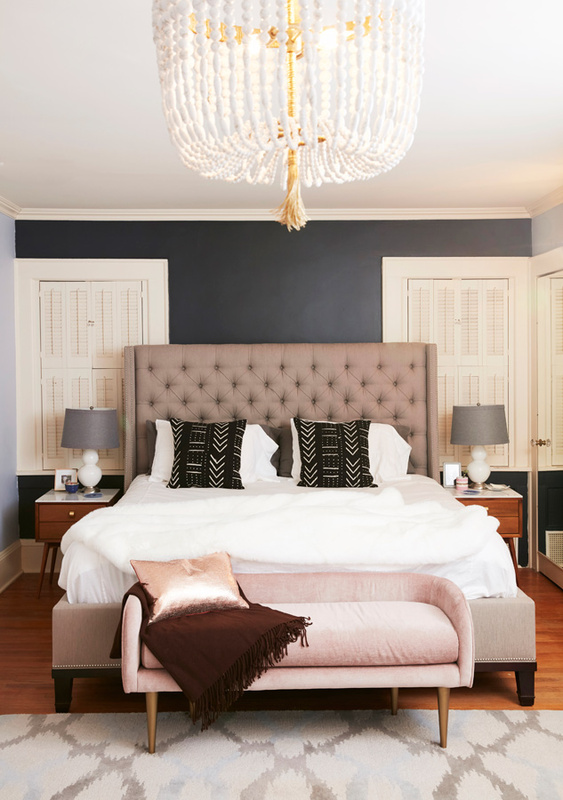 Ever since Alexis laid eyes on a particular Lindsey Adelman chandelier in a magazine, her obsession drove her to search for an affordable alternative (see above photo). She found a similar fixture for $1000 in Australia. After confirming with her cousin who happens to live in Australia that the company was in fact legit, she had it shipped all the way to Maplewood NJ. “I’m lucky Justin is so handy. He did the electrical wiring for each arm”. 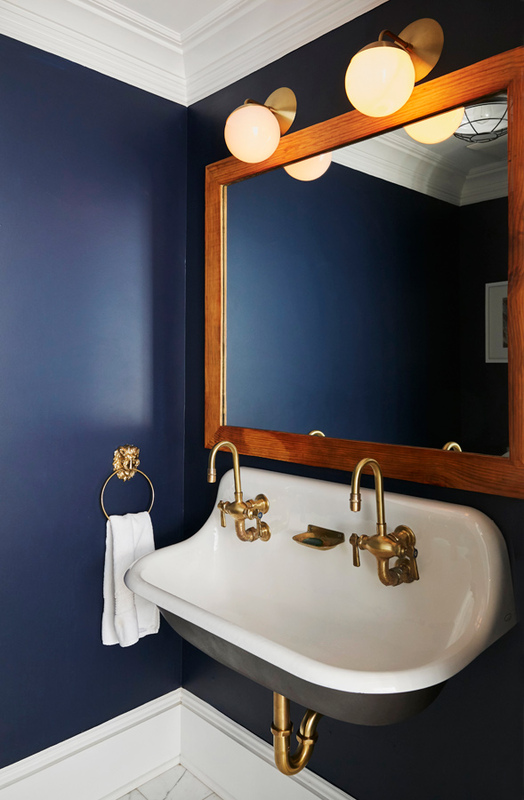 The brass faucets in the powder room are in fact, chrome because the Kohler sink model’s faucet is only produced in chrome. “I really wanted brass so we found some random place in Newark, NJ. I think the place usually does things for cars but I called them up and they said they would and it wasn’t that expensive”. It didn’t work the first time around–the faucet rusted. “I had to have the plumber come back to take it all off again and bring it back to the brass plater. It was a huge hassle but it was so worth it to me”. It’s all about that brass. Alexis wanted brass faucets but they only came in chrome. That didn’t stop her! Alexis muses, “The perfect green is such a beautiful color…it’s like a mixture of emerald and jade”. Navy, like white and gray, are all good neutrals and a beautiful pop of color like green compliments them beautifully. Her green muse? “My favorite silk shirt that I have is this beautiful green. I always get compliments when I wear it, so I always look for that”. “I’m into having things look pretty”, Alexis says with a smile. Neutral colors in varying shades from light to dark give the master bedroom a dramatic yet streamlined look. A mix of modern and vintage styles in various materials like marble and wood are, effortless and elegant. 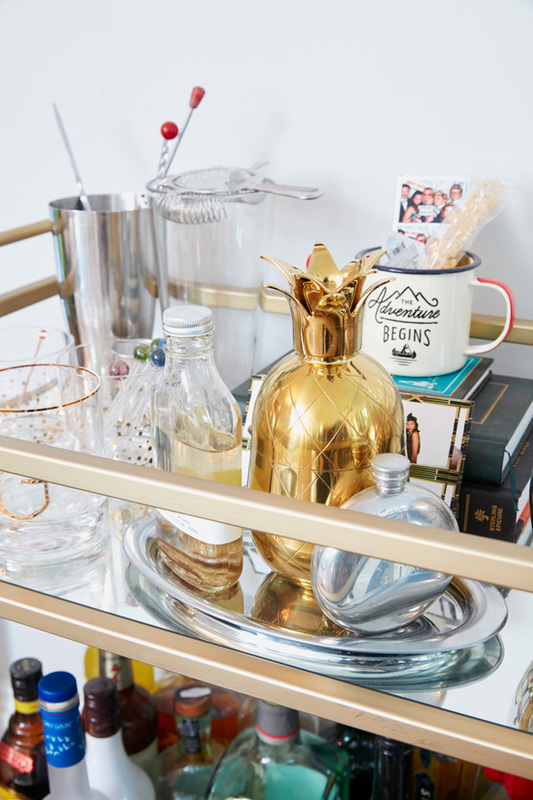 The nightstands are a one-of-a-kind Alexis creation. The stands are from West Elm. 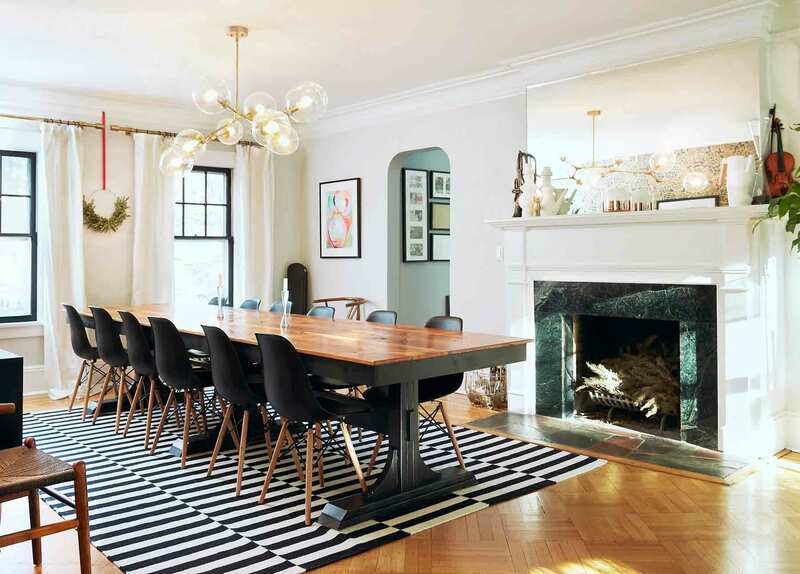 She bought Park Studio pulls and marble tops to give them a “different, lux, glamorous” look. Don’t hire the least expensive contractor. You may want to hire the most expensive company, but that’s not necessarily the best option always. But you do tend to get what you pay for. Get references. And not just two or three. Get the names and numbers of as many past clients as you can and call each one. It may take a lot of time, but it’s worth the peace of mind in the end.